We’re proud to present Sugar and Charm’s party buying guide! It’s an excellent resource for buying party essentials like drinks and snacks for entertaining up to 24 guests! 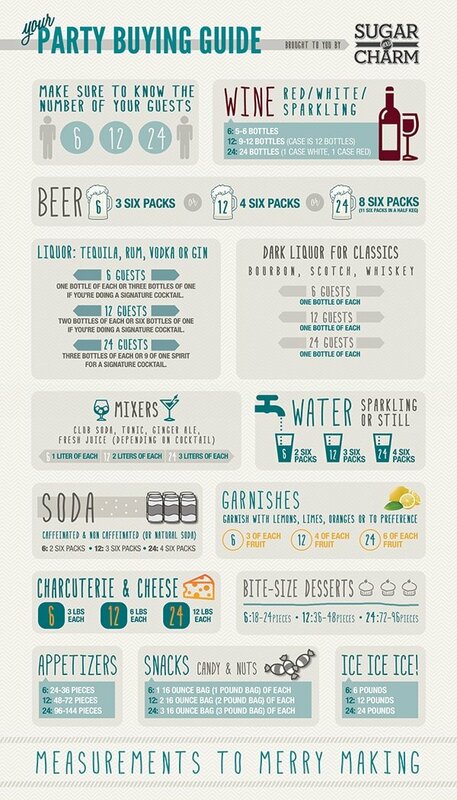 If you ever need to know how much liquor or bite-sized desserts to buy, this guide will be your best friend. Be sure to Pin it so you always have this convenient buying guide on hand! For a printable PDF download click here! This is brilliant! Your posts are always beautiful, creative, and real! I will definitely be referring to this in the future. Yah, great idea about framing it!!! I agree about framing it! I’m going to do the same! !